The news media is saturated with headlines about the "record-breaking" US heat wave over the past week. 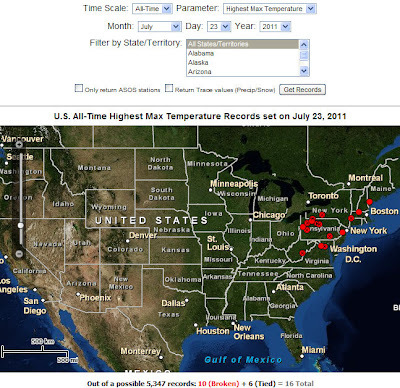 However, the NOAA database of all-time Max Temperature for the entire US from over 6000 weather stations shows that there were no records broken on July 17, July 18, July 19, or July 20th. A total of 4 stations broke records on July 21, 20 on July 22, and 10 on July 23, 2011, for a grand total of less than 0.4% of stations breaking a temperature record sometime during the past week. More than 99.6% of stations failed to break records sometime over the past week. Thanks for the real scoop. Matt Drudge desperately needs a chill pill and your link. So just a few minutes on Google News shows your story is already incorrect. DO YOUR HOMEWORK !! Oh right, you on Google News is more authoritative than the official keeper of US Weather Data, The National Atmospheric and Oceanographic Administration. Instead of reading unofficial reports from newspapers, go to the NOAA site linked in the post and read it for yourself. DO YOUR HOMEWORK!! But where do you think newspapers get their weather information? They get it from the "official high temperature station" in that city or town. I can find you hundreds of correct high temperatures without ever going to NOAA. They are not the only source of weather information. At your NOAA site, that page selects "highest Max Temperature" which is not at all the same as "highest temperature on this DATE at a locale." So your stat is right. But all that means is that no one set "all time highs EVER for that location" in the time frame you indicated. 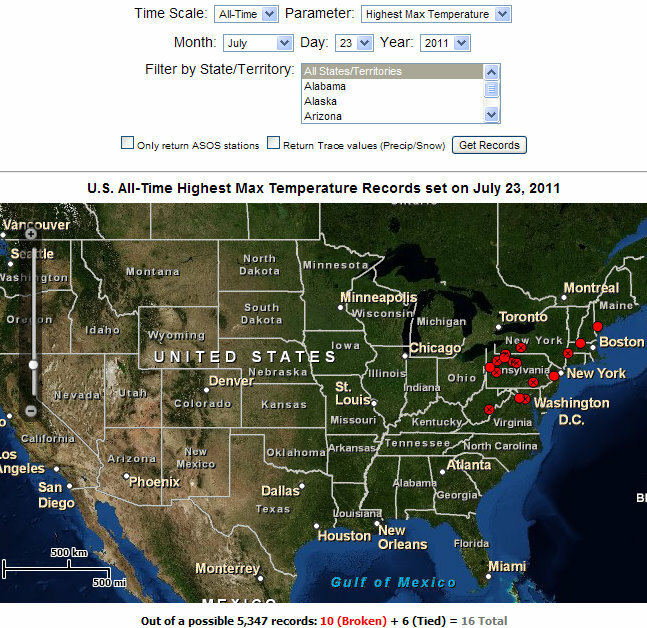 All those towns setting "highest temps ever for the date July 21st" will not show on that database. That is the normal definition of a "record high temperature." 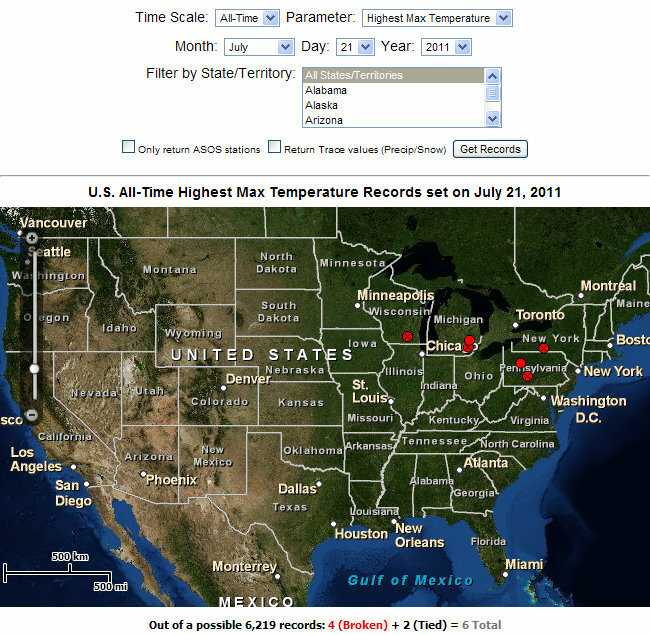 You were right, but the NOAA site is not returning useful record temperature data. So there were 206 records tied or set on July 21st. I've noticed that religious fundamentalists have been citing "120 here" and "115 there" but fail to mention that they are talking about the heat index. It's really annoying when they do that, but then I guess lying and misleading are par for the course when you're pushing the Global Warming agenda. P.S. So this heatwave is climate and not weather, right? I get so confused trying to figure out when weather is climate and when it's just weather. If you're up for it, take a look at the typical numbers of stations which set records during any heat wave of the past. When you have thousands of stations, statistics dictate a handful are going to hit records during any heat wave (and even when not in heat waves). In the low CO2 environment of July 23, 1934 for instance, 23% of the stations hit new daily highs since 1850. Point is, ANY heat wave is going to break some records every time. Setting the Time Scale to "daily" instead of "all time" as you did results in an average of ~1.4% of weather stations breaking records on a "daily" basis. See comment above. Completely bogus blog...click on the link below for the 900 high temperature records set just this week. 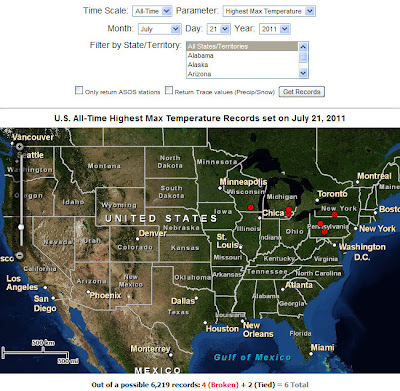 Wrong- a tie is not a "record"
NOAA/NCDC (National Climatic Data Center) do not consider a tie to be a broken record, as they state in the screen captures above. 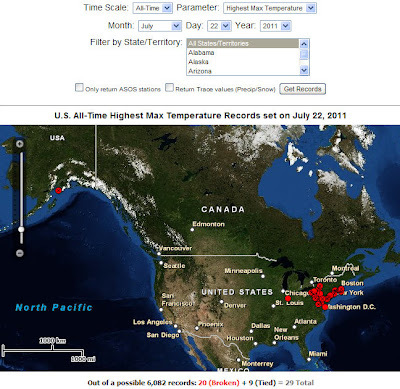 NOAA/NCDC are the official keepers of the US temperature record, not the National WEATHER Service. Take, for instance, the first tie on the list Keiser, AK, which shows it was 100 on 7/22/79 and 32 years later in 7/22/11. This accounts for the difference - unfairly counting TIES as BROKEN RECORDS. The number of US weather stations has greatly increased by a factor of 6 since the dust bowl and by a factor of 400 since 1920 when there were only FIFTEEN stations in the entire NOAA database! THEREFORE, THE EXPONENTIAL INCREASE IN STATIONS OVER THE PAST CENTURY WILL RESULT IN AN EXPONENTIAL INCREASE IN THE NUMBER OF RECORDS BEING BROKEN WITH OR WITHOUT HEAT WAVES. Note above comment should read "only FIFTEEN stations in the entire NOAA database with at least 30 years of data." In comparison, the current NOAA database has about 6,200 stations with at least 30 years of data. Holy cow! Who'd of thought it might get hot somewhere in July? I don't care how many stations had a record matched or broken. What matters is what the average temp will be for the year when the year is over. Will it show a warming trend, flat trend, or cooling trend? That is the question. The probability on any day of setting an "all-time" maximum temperature, a "monthly all-time" maximum temperature (that is, highest ever recorded in a July), and a "daily all-time" maximum temperature (that is, highest ever recorded on a July, 15) are all very different. You are choosing a metric that has a very, very low probability of setting a new record, which is why you find a very small number of new records. Furthermore, you are limiting yourself to one type of record - another interesting record which is of equal important is record-high *minimum* temperatures. In short, the sample of records you are using to characterize the magnitude of the recent heat wave is arguably not the best metric, and seems designed to minimize the number of records reported. The skeptic in my is suspicious that this is a deliberate effort to minimize the severity of this heat wave. So your point is that yes, in fact, a number of records WERE broken -- but not as many as you think there should be to qualify as "record-breaking." Of course some records were broken, as stated in the post. With currently over 6000 stations, the exponential increase in stations over the past century (many with relatively short records not including the 1930's and other relatively hot periods in US history), records get broken with or without heat waves. A TIE does not BREAK A RECORD, yet the media is claiming it does to inflate the numbers. The media also makes no mention of the great increase in the number of stations with shorter records, which guarantees an exponential increase in the numbers of records broken. Hey SarryLingleton, I live in Canada and the claim that Toronto had its hottest day ever is simply a lie. It was not one day, but three! For three days in a row July 8, 9, 10, 1936 Toronto, ON hit 105f or 40.55c without humidity factored in! This makes 37.9c seem paltry in comparison.Here is a few more temps for you and other warmers. Ontario, Can. provincial record 42.2c at Atikokan and Fort Frances. "On this date, there has NEVER been a HOTTER day." You can truthfully say that with a BROKEN record. You can truthfully say that with a TIED record. Don't even try to disprove it...it's not possible. They are equal in that regard. No, they are not equal, and that is why the screen captures above give the numbers that are "broken" and the numbers that are "tied." Oh please, by your logic if a location has had a maximum temperature of 100 degrees 5 times in the past, each time it's a RECORD BREAKER. Do you work for the global warming industry? I was looking for hockey records and found a weather report!